Stobie says of her art: "To me it's just playing." When Kirsten Stobie and her husband bought their house, everything was pink. The bathroom walls, the countertops. The rocks outside in the garden were painted pink, too. So she apologizes when she opens the door of her new house, a cottage tucked away in a far South Hill neighborhood. Ignore the mess, she says. It's hard work getting the pink out of everything. 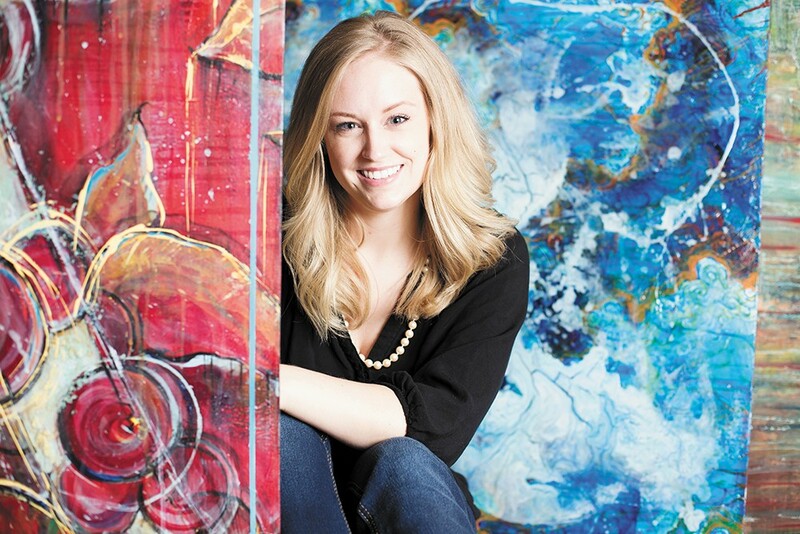 It's clear, quickly, that Stobie — a 28-year-old who works at Numerica Credit Union by day and makes her art by night — has an eye for making things beautiful. Inside, her home is painted in deep blues and dramatic reds. Immaculate taxidermy hangs from the walls, and canvases are around each corner. At the dining room table, a little girl with a bow in her strawberry blonde hair chomps on some carrot sticks. Stobie, who grew up in Spokane Valley, says it was her art teacher, Ms. Smith at East Valley High School, who made her realize that her gift for art was something special. "She kind of lit the fire in me," she says, as she steps back and looks at a cluster of her paintings in her downstairs painting room. "She has a way of bringing out your passion." She says there have always been these people in her life who have pushed her and encouraged her with her art. Her friends, her family, her coworkers at Numerica. "To me it's just playing," she says, starting to laugh. "So it's weird that people like my playing." Stobie paints bright abstracts, impressionistic landscapes and the occasional portrait with confidence. She hangs her art in wineries and art galleries, and teaches painting classes for the Tipsy Muse, an organization that hosts painting and wine parties. And she has become known for doing live paintings at benefit auctions and art openings. "It's fun for [people] to see a white canvas transform into a painting in front of them," she says. She says that within her love for making art, she's found another passion: selling those paintings she makes live and donating the money to charity. With her paintings, she can make a difference. "I want my daughter to grow up and know how important it is to help people," she says, stroking her daughter's head as she clings to her leg. "Huh, dude?" She looks up at her mom and says, "Yeah!"